A modern 3D remake of the old good Falling Blocks game. Extremly addictive! 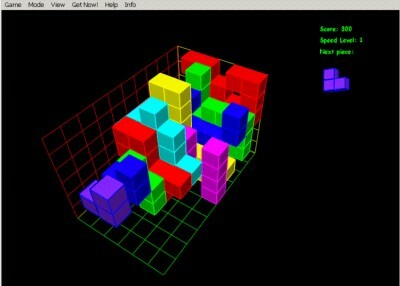 Overkillix3D 1.6 is arcade software developed by Eugen Garber. The old good Falling Blocks game is coming back in 3D! Enjoy now real, I mean REAL 3D feeling and extremely addictive gameplay. The game is recommended for anyone, since it challenges and trains 3D-thinking, spatial skills and reflexes. You get 5 different game modes, Anti-boss feature and good performance, even on old graphic cards. Now as freeware! This arcade software is freeware, which means you can download and use Overkillix3D 1.6 absolutely free. There's no need to buy the product. Overkillix3D 1.6 supports different languages (including English). It works with Windows 98/XP/Vista. Latest Overkillix3D 1.6 does not contain any spyware and/or advertise modules, allowing installing it with no worries concerning valuable information loss. We has completely tested arcade software Overkillix3D 1.6 many times, written and published the interesting article and uploaded installation file (583K) to our fast server. Downloading Overkillix3D 1.6 will take several seconds if you use fast ADSL connection. Fatman Blocks 2 - original graphically rich puzzle game with addictive gameplay. Pentix is advanced version of very popular falling blocks game Classic Tetris. This is a falling blocks game which is.